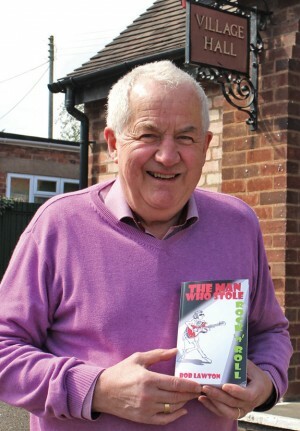 Village cartoonist Bob Lawton has turned his hand to novel-writing. They used to say that if you could remember the 1960s, you probably weren’t there . . . but Bob Lawton has drawn on his vivid memories of the decade for his first novel. As lead singer of The Swinging Chimes, Bob was part of the ‘Brumbeat’ scene in the early 60s, and some of his own experiences form the basis for The Man Who Stole Rock ‘n’ Roll, a thoroughly enjoyable tale of musical success and excess – and, er, time travel. “That’s the made-up part!” laughs Bob, who originally intended the story to be a cartoon strip featuring a band who popped up in different musical eras. It turned into a novel after he began jotting down recollections and anecdotes from his days in the music business – which includes managing The Rockin’ Berries, contemporaries of The Swinging Chimes and some of Bob’s greatest friends, who are still going strong after more than 50 years. Bob himself quit the music scene in 1965 to marry Cynthia (they’ve just celebrated their Golden wedding anniversary) and made his career in sales and marketing in the flooring business, also working as a professional cartoonist for The Birmingham Mail and other publications after winning the Punch Amateur Cartoon competition in 1976. “When I retired five years ago, The Berries asked me to be their manager, and that certainly brought back some memories,” he recalls. 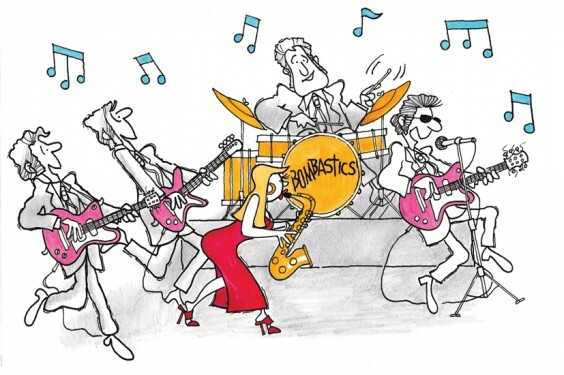 The Man Who Stole Rock ‘n’ Roll is the tale of Frankie Atom and the Bombastics, a young Birmingham band who hit the big-time in the early 60s. “The Swinging Chimes never quite got that far,” says Bob modestly, notwithstanding having shared the bill with the likes of Billy J Kramer & the Dakotas, Gerry & the Pacemakers and even The Beatles. Of course, they never time-travelled either, but the other aspects of the Bombastics – the members meeting through school music lessons, the shenanigans while travelling the country on tour, and above all the constant knockabout banter between the bandmates – all have their roots in the shared experiences of The Swinging Chimes and The Rockin’ Berries. The fictional band’s original lead singer even left to try his luck in Hamburg, just as Geoff Turton left the Chimes to join the Berries in one of the many musical crossovers in the Venn diagram of Brumbeat groups. However, Bob hasn’t relied entirely on his own memories – he carried out plenty of research for the book, particularly for the Bombastics’ tour of America as they try (and largely fail) to impress music fans across the pond. The Chimes and Berries never went to America, but the Berries’ current bass player, Rick Price, had toured there as a member of The Move and Wizzard. “Rick’s input was priceless, especially as he had actually done Route 66,” says Bob. And he also turned to Rick for help when it came to writing one of the songs featured in the book – Jive Away The Tears, a number one hit for the Bombastics. The song (available on YouTube accompanied by Bob’s cartoons of the band) really does sound as if it could have come from the Bombastics’ era, albeit with a hint of Wizzard thrown in. There are plans to make a few more of the fictional hits into reality: “I reckon it could make a great musical!” says Bob. Bob also took inspiration from Stephen King’s 11.22.63, whose protagonist travels back in time to prevent the assassination of JFK. In Bob’s story, the ramifications include accidental plagiarism – with songs stolen from the future rather than the past – and eventually to tragedy. Just as the Bombastics are about to achieve stardom, their larger-than-life guitarist Barry Harper somehow slips through a wormhole via the radio in the band’s VW camper van and ends up spending a week in 1983. The decisions he makes based on that bizarre trip change not only his life but the lives of everyone around him. But although time-travel is the lynchpin of the story, it’s the insight into the music business and the realism of the likeable characters that give it flesh. The book switches between the 60s, the 80s and the present day, when the now-OAP bandmates are planning a reunion (another example of art imitating life) and the flashback episodes cleverly build up a picture of the Bombastics’ journey that isn’t fully complete until the closing stages. The tale evokes warm nostalgia for the 1960s and, thanks to the time-travel element, throws in plenty of 80s cultural references too – perfect for music fans of both eras. It’s fun and funny, an irreverent yet affectionate portrait of a vanished age. The Man Who Stole Rock ‘n’ Roll is available for Kindle (£2.59) or as a paperback via Amazon. Sales so far have been encouraging – Bob has already sold one copy in America and two in Australia!